Over 110 years of Otani businesses in Oxnard! 5 Generations of Otani's Proudly serving Downtown Oxnard since 1908! The Otani family has been proudly serving Oxnard since our first business opened on the boulevard in 1908. Five (5) generations and over 110 years later, we are continuing the tradition of a casual, no-fuss dining experience with quick friendly service. Otani’s Seafood was started by Izuto “Izzy” Otani in 1952. Izzy loved 3 things; his family, his community and spending his free time fishing off the Ventura County Coast. There are many stories about seeing him early in the morning, walking down 5th street towards the beach, with his fishing pole in hand. With his wife Helen by his side, Izzy left the other family businesses to turn his passion for fishing into a business of his very own. “Izzy Otani Fish Market” opened for business at 608 S. "A" Street in Oxnard CA (in the same location it stands today). Otani's in the late 1960's when it was the Fish, Bait and Tackle store. (Notice the fishing poles on the right and the light coming through the back where the building ended. The seafood that was sold in the market was a mix of fish Izzy caught himself during his morning escapes, the fresh catch of the local fishermen, and only the best from the San Pedro markets. Following in his hard-working father’s footsteps, Izzy was constantly looking for ways to grow and expand. And he did! The business grew to include Japanese groceries and even a fish bait & tackle shop. As the business grew, Izzy made sure the building also expanded to accommodate all his changes (Izzy tore down his home that was on the back of the property to build a large walk-in freezer and cooler). With hard work and dedication, Izzy created a reputation of selling the freshest fish, and would often treat his employees and customers to fish he prepared from his own unique recipes. After years of encouragement to start a restaurant, Izzy and Helen closed the fish bait & tackle shop to free up space for a kitchen and a few restaurant booths. In 1972, they opened a small “take home shrimp shop” nicknamed “Izzy Otani’s Shrimp To-Go.” The restaurant eventually expanded its menu, adapted the motto "Boneless Fillets are our Specialty," and would pull its menu items straight from the fish case. The restaurant was a hit and slowly expanded into the restaurant it is today. Izzy passed the restaurant on to his son, Steve, and Steve has since passed it on to his children, Karen and Genji. Izzy may be gone, but his heart still beats through the current generation of Otani’s that are continuing the tradition of a casual, no-fuss dining experience with quick friendly service. *Fun Fact* If you know where to look, you can actually see the levels of expansion. For example, one of the four windows on the front of our building is taller (and the width and height of a door). Over 60 years ago, that was the original entrance to Otani's when Izzy first started. Oh, and the old ceiling fan, that has been there since day one too. The history of Otani’s Seafood isn’t complete without paying homage to all the Otani family businesses that came before it. Izzy’s parents, Toraichi and Shina Otani, moved from Hiroshima, Japan to California in the late 1800's. In 1908, Toraichi started a grocery store on Oxnard Boulevard next to what is now the old Teatro Theater. Oxnard incorporated in 1903, just 5 years before Toraichi started his first business. Oxnard in the early 1900’s was full of change and growth and Toraichi was determined to grow along with it. Like most of the businesses in those days, the “T. Otani Grocery Store” was a 2-story building, with the business on the first floor and the family home on the second floor. The business evolved many times over the years and it also housed a barber shop (rumors are: Toraichi was one of the barbers and would use a bowl to give customers the perfect “bowl cut”). In 1910, Toraichi Otani opened a pool hall with 4 tables at 520 Saviers Road. And in 1912, Toraichi was one of the 8 pool hall owners that successfully started and signed a petition to lower the age of men allowed to frequent the Oxnard pool rooms from 21 to 18. Everything changed in 1929 during the Great Depression, but Toraichi was determined stay in business. He reduced his grocery inventory to the bare necessities and gave hair cuts out at a discounted rate. Toraichi also moved his whole family and all their belongings into one room and rented out the rest of the space to families that lost everything in the stock market crash. The business doubled as a boarding house upstairs and continued to house tenants even after the Depression ended. Toraichi and Shina had 5 kids; 3 boys and 2 girls, with Izzy being the oldest. The boys grew up working for their father and learned everything they could about business. After the Great Depression, they ventured out and started a produce stand down the street called Otani Bros. Produce. Both Toraichi and the Otani Brothers stayed in business until the Bombing of Pearl Harbor. Izzy’s 2 brothers joined the US Military before the mandatory evacuation of all Japanese in WWII. On February 19, 1942, shortly after the bombing of Pearl Harbor, President Franklin D. Roosevelt signed Executive Order 9066. About 120,000 people of Japanese descent (over 60% of them American citizens) were forced to leave their homes and only take what they could carry. The Otani family piled all the treasures they could not carry in one corner of their room upstairs and were sent to live in the Gila River Internment Camp in Gila Arizona. Before they left, they opened space in their room to family and friends to also store their treasures. Luckily, family friends moved into Toraichi's home upstairs and were able to save the house, but the businesses did not survive. Many Japanese families lost everything, but the Otani's were very lucky. Businesses had to close and property was seized, but the Otani Brothers refused to give up. Shina passed away in camp, and Toraichi was exhausted from the whole experience, but the 3 Brothers were back together and even more determined to succeed. They returned home to Oxnard and tore down the old wood building, rebuilt and started the Otani Brothers Malt Shop (it was inside that Malt Shop that Izzy perfected his tempura shrimp and tartar sauce recipes). We still have customers share their memories of time spent at the Malt Shop. Some of our favorites include stories of selecting their favorite song in the jukebox, enjoying their shakes on a date before they went next door to the theater, and the unique menu items like the avocado cheeseburger. Izzy Otani Fish Market on A Street and The Malt shop on the Blvd. operated concurrently for a few years. The Malt Shop eventually closed in the mid 1950’, but the stories and memories last a lifetime. Otani Bros. Produce newspaper add from 1938. Our phone number was 21! "Phone 21 for Free Delivery"
Newspaper clipping from 1948 from Otani Brothers Malt shop. "40 years in one location We Have Served OXNARD"
1935 – The 3 Otani sons (Izzy, Bow and Toby) wanted to follow in their father’s footsteps and start a business of their own. They started “Otani Bros. Produce” inside the Thompson City Market (owned by siblings, Bill and Helen Thompson) on the corner of “A” and 5th Street. Izzy ran the fruit market full time and the other two brother balanced their time between the 2 businesses. 1942 - (February) Executive order 9066 was signed giving the military broad powers to ban any citizen from a fifty- to sixty-mile-wide coastal area stretching from Washington state to California and extending inland into southern Arizona. The order also authorized transporting these citizens to assembly centers hastily set up and governed by the military in California, Arizona, Washington state, and Oregon. 1942 - All Japanese in this area were evacuated and sent to live at the Gila Arizona Internment Camp. The evacuees were only allowed to take what they can carry, so Izzy and Helen allowed family and friends to store photos and other mementos in one of the bedrooms of the 610 house. Otani's Bros. Produce was leased out, the 620 business/home was rented to a Mexican/American family friend, and Izzy and Helen's family home was rented to the family of George Doctolero (Filipino). 1942 - The Gila Arizona camp officially opened on July 20, 1942. The camp was located on the Gila River Indian Reservation about 50 miles southeast of Phoenix, near the town of Rivers. The 16,500-acre site actually consisted of two separate camps, with the larger of the two, Butte Camp, located 3-1/2 miles west of Canal Camp. The average summer temperature was 104 degrees and has been known to reach 125 degrees. 1944 - Izzy was allowed to leave camp through a work program, but was not allowed to return home to Oxnard. Izzy and his family were sent to live in Popular Grove, Illinois where Izzy worked as a dairy hand at the farm of Jim Morehead. 1945 - All internees were allowed to return home, but most people did not have anything left to return home to. Canal Camp closed on September 28, 1945, and Butte Camp closed on November 10, 1945. 1946 - All the Otani's return to Oxnard. The Otani Bros. Produce business had gone broke, but the property and building of the 620 Blvd. business/home was still there. The Mexican/American family moved out and Toraichi moved back in but did not open up for business (He was 68 years old, tired and missing his wife. Toraichi lived in Hiroshima till he was 21 still had friends and family there before the bombing, and his children were loyal and loved America (2 of them joined the military to fight Japan). Being interned and everything about the war with Japan took everything out of him). The Doctoleros moved out of the 610 A Street home and Izzy and his family moved back in. All the Otani men went to work for Allis Chalmers, where they made and sold farm equipment. 1948 - The Otani men pulled all their saved money together, quit their jobs and started to rebuild the business on the Blvd. The El Teatro Theater was already next door so the business they created in place of the old grocery store was a Malt Shop and the 3 Otani brothers all worked there. Izzy cooked, Bow worked the counter and Toby was in charge of the soda fountain. Some of the most memorable menu items were the avocado cheeseburgers, fried fish, fried bologna sandwiches and the homemade ice cream (we still have customers come in and tell us stories about sitting on the counter after their movie and listening to the jukebox till the sun went down). 1949 - Toraichi owned land around 1450 S. Oxnard Blvd. He divided up the land between his 3 sons and Izzy sold his land to Sal Lopez (Sal's Mexican Inn). With the money from the sale, Izzy purchased the land in front of his house, 608 S. A Street, and built our present building (it was the residence of Constance Moreno before he tore it down). He rented the building to Rice and Sons Auto Electric and continued to work with his family at the malt shop. 1954 - Izzy expands the business and takes over the whole building, creating Otani's Fish Bait and Tackle. 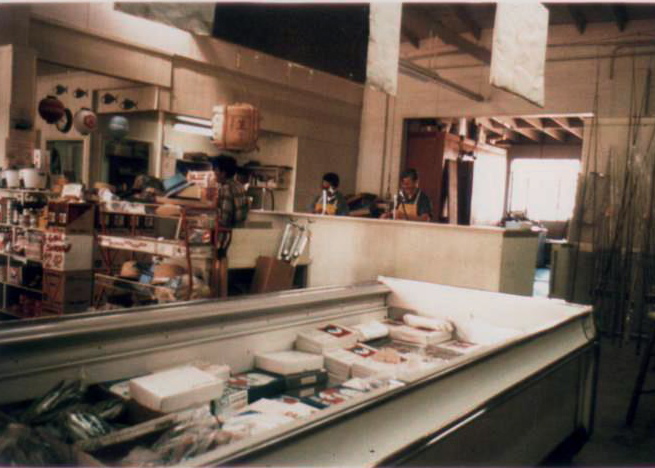 When you walked in the front door, the fish market was still on the left side (where it originally was), the Japanese groceries filled the shelves in the middle and the frozen items, bait and fishing supplies were on the right. Some of the most memorable items were the custom-made fishing poles, hand-tied lures, smoked fish and Izzy's famous "sugar-cured mackerel" bait. 1967 - Izzy and Helen moved everything out of the family home (that was in the back of the fish market) and tore it down to expand the business again. In place of the house, they built another large walk in freezer and cooler. 1972 - Izzy used to give cooking classes using the fresh fish and ingredients found in the market. Following in his father's footsteps of "always updating your business to fit your customer's needs," he closed a portion of the market and built a kitchen in its place. The restaurant pulled its seafood items from the market and was very casual with counter service, paper plates, only 8 tables and hand written menus of items made from Izzy's own recipes. 2015 - Otani's Seafood created an "Otani's Seafood" phone app, started accepting online orders and offering "curbside service"